If you haven't given any thought to what ugly sweater you'll wear this holiday season, you need to get on that right away. We're already well into November, and Christmas will be here before you know it. But don't panic! We're here to help you with a selection of the ugliest, nerdiest, Christmas sweaters of 2018. In our opinion, the best ugly nerdy sweater designs can be found at Geekstore. They're the highest quality sweaters of the bunch (fully knitted designs), and the prices are reasonable running between $45 and $55 with free shipping. They're produced by the UK-based company Numskull, who have been putting out some of the best designs for Marvel, DC, Star Wars, Rick and Morty, Harry Potter, and various video game franchises for the last several years. You can shop them all right here, but you might want to jump on hot items like the Harry Potter LED Hogwarts Castle sweater and the Spyro the Dragon sweater quickly. Another company that puts out awesomely ugly and nerdy Christmas sweaters year after year is Fun.com. Again, the sweaters are high quality and are reasonably priced in the $35 to $50 range (plus shipping). Their collection includes lots of DC Comics and Star Wars designs, but you can also find sweaters for WWE fans, Labyrinth, The Dark Crystal, Care Bears, and more. 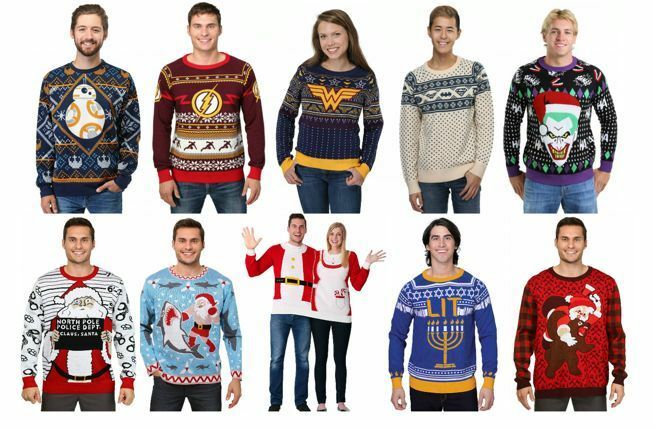 They also have quite a collection of odd sweaters like Santa vs Shark. The best place to get them in the US is via their sister site HalloweenCostumes.com. 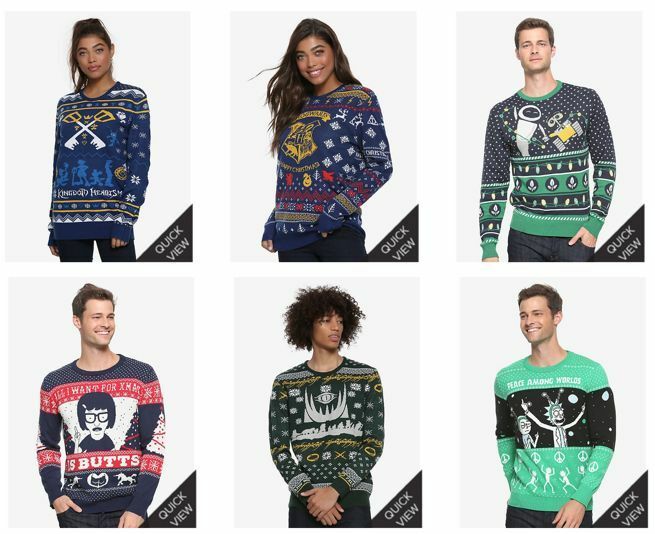 BoxLunch is another retailer that put out some great ugly Christmas sweaters this year. They're a bit pricier at $60 (shipping is free over $75) but we love their Kingdom Hearts, Harry Potter, WALL-E, and Lord of the Rings designs. You can shop the entire collection here. 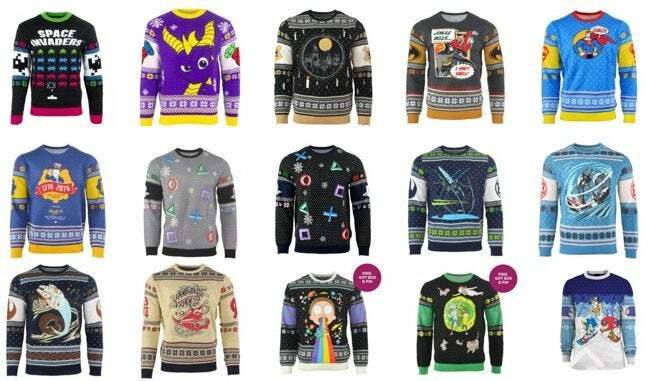 If you're on a budget, Target has put together a collection of ugly Christmas sweaters that can be had for as little as $17. The collection includes some Star Wars and Disney designs, but we're particularly fond of their weird ones. Portrait Studio Santa, The Gift of Tacos, and Rainbow Unicorn are a couple of prime examples. You can shop the entire collection here. UPDATE: Target also has an awesome and affordable Game of Thrones ugly sweater line! 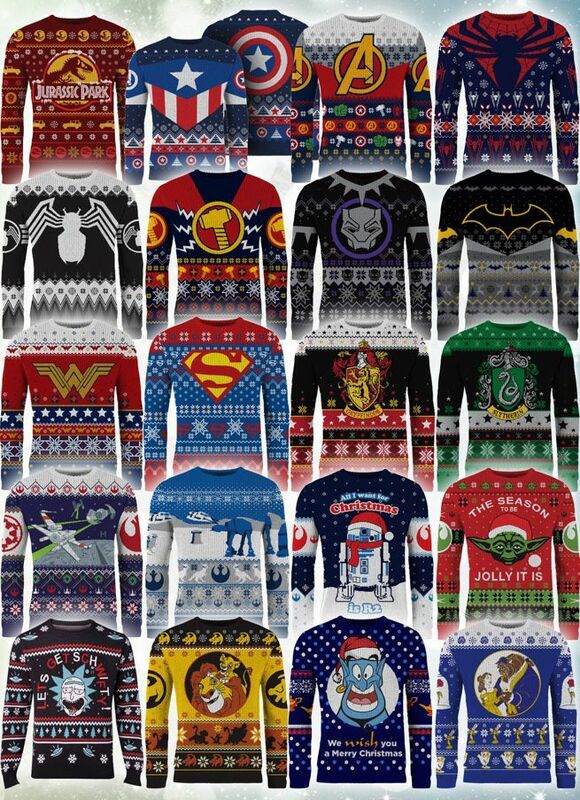 UPDATE: Merchoid also sells a lot of ugly Christmas sweater designs from the Numskull line, but they have plenty of awesome exclusives to choose from that covers Marvel, DC Comics, Disney, Harry Potter, Star Wars and more. The image above points out these exclusives, and you can shop them all right here with free shipping.